The purpose of this PowerPoint is to introduce Constructive Conversation Skills and the Start Smart 1.0 Lessons. 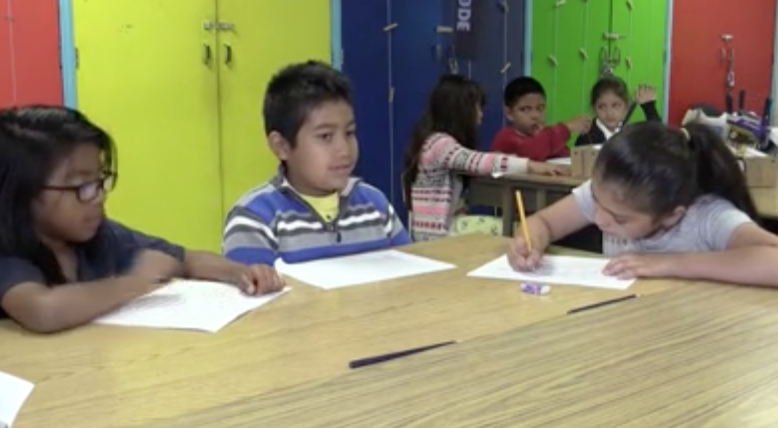 Disciplinary Discussions Using Text Sets (DDUTS) is a Designated ELD unit that provides an instructional target for English Learners’ progress in the ELD Standards for the second semester of an academic year. These lessons use text sets (visual texts, written texts, audio and video) to engage students in more rigorous Constructive Conversations that require analysis and synthesis of content across multiple texts. 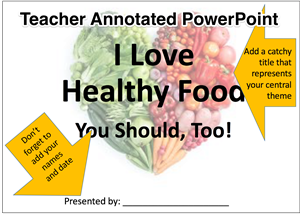 This unit is unique in that it requires students to engage in research as part of their learning. Students are supported in generating original research questions based on the content of the text sets, and then guided through a research process, which culminates in an oral presentation. The culminating oral presentation integrates research and technology skills, and invites students to demonstrate knowledge that advances their understanding of the topic. 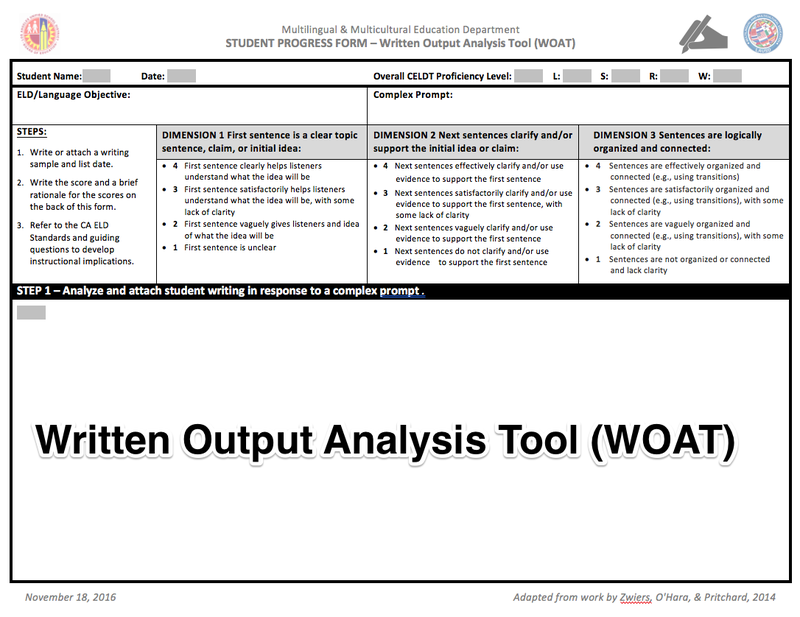 Critical analysis lessons, grounded in the content of the text sets, are integrated into the unit to assist students in preparation for the rigors of SBAC and ELPAC. These specific lessons explicitly teach students how to evaluate relevant evidence and write short responses that use evidence from multiple texts to support a unifying idea. This unit is presented in digital format. Included is audio for all Models and Non-Models. 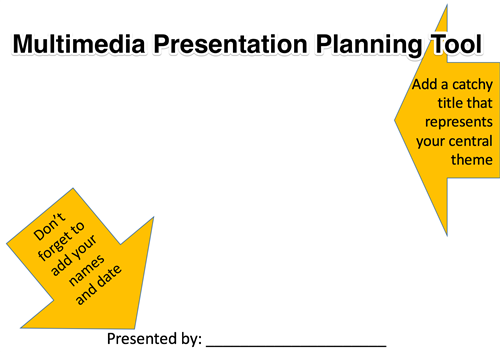 Lessons consist of PPT slides to be used by the teacher for instructional delivery. Click images to download videos. 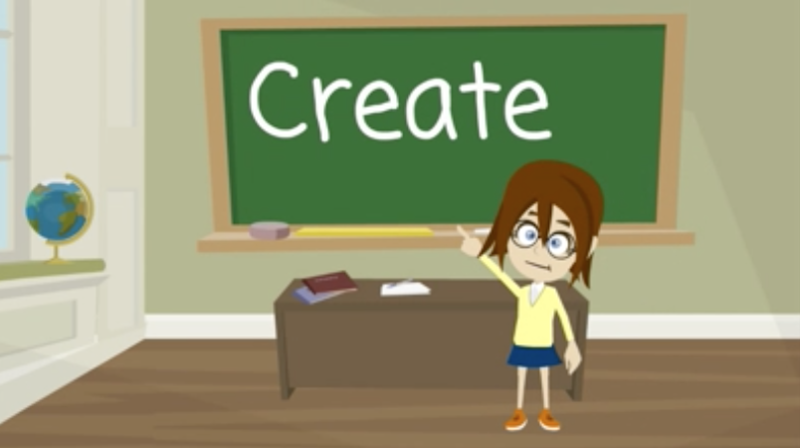 This video is of a 2nd grade classroom during Day 1(CREATE) of the Start Smart Unit. 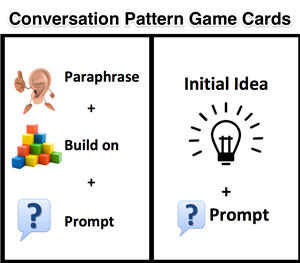 The students have practice the skill of CREATE by playing the Constructive Conversation Game. When the video begins the teacher has selected two students to come to the front of the class and model their constructive conversation. She reminds the students to listen to the model conversation using the Listening Task posters. 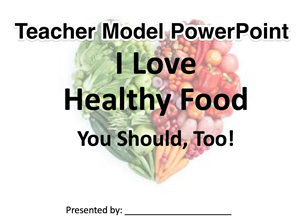 She reminds the two students who will model to use the prompt and response starters for that skill. The teacher collects a language sample using the SPF. 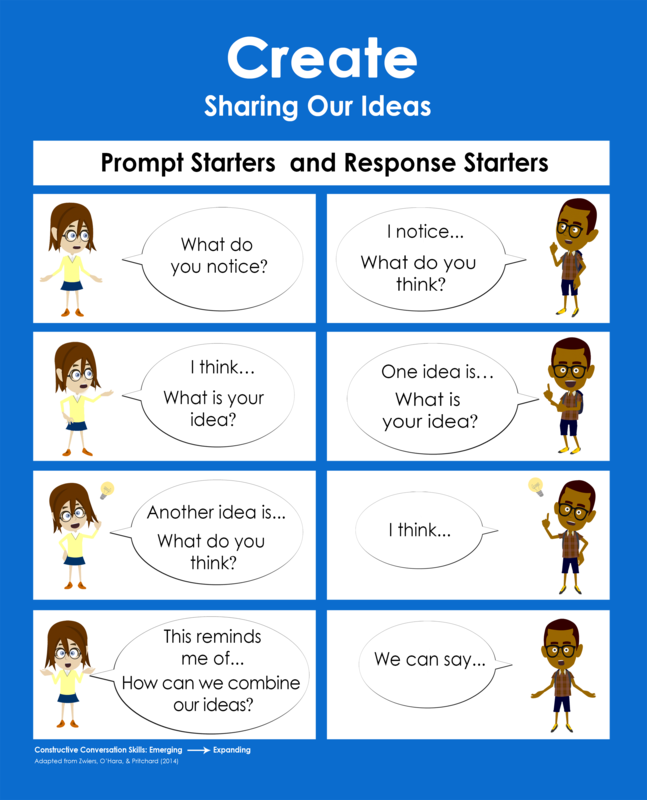 Finally, the teacher debriefs with the entire class and guides them to reflect on their own conversations. She asks the students to revisit the object for the lessons and also to reflect on whether they used the conversation norms during their conversations. Specifically she asks them to think of three examples of using the conversation norms during their own conversations. 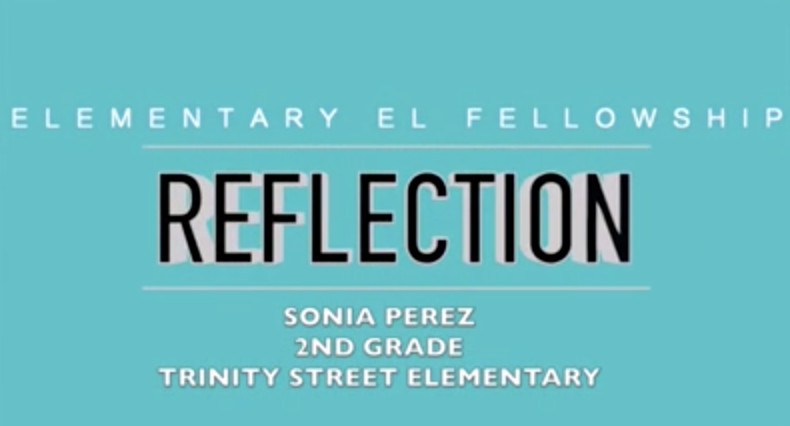 This video is an interview between Isabel Aguirre, the lead facilitator for the Elementary Designated ELD Fellowships and Sonia Perez, an Elementary Designated ELD Fellow and 2nd grade teacher at Trinity Elementary. Ms. Perez was interviewed because of her highly skilled implementation of the Constructive Conversation Skills lessons. She is asked to reflect on how her teaching has changed based on what she learned as an Elementary Designated ELD Fellow. Her response includes her personal connection to the work. 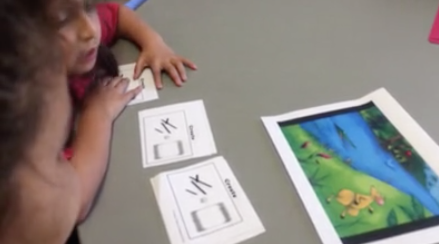 This video is of the Guided Practice/Modeling activity of day #1 of the Start Smart Lesson. Ms. Perez, the teacher, and a student are reading the script of the Model for the Constructive Conversation Skill of CREATE. This instructional strategy of modeling the expected oral output is an essential component of an effective Designated ELD lesson. 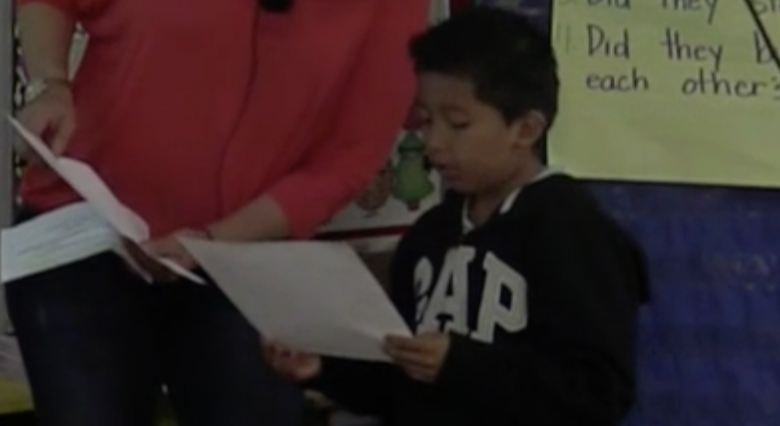 It is introduced during the Start Smart so that students learn how to actively listen to model conversations which is a strategy that is used daily during Designated ELD. This video is of the Guided Practices/ Revising the Non-Model activity that is part of Day 2 of the Start Smart Unit. This instructional activity requires the students to work in a triad and collaboratively revise the non-model language sample for the Constructive Conversation Skill of CREATE that was collected and transcribed by the teacher on day 1. This video continues with the Guided Practice activity of revising the Non-Model for the Constructive Conversation Skill of CREATE. Two students from the triad in video #3, volunteered to present their revised non-model to the class. 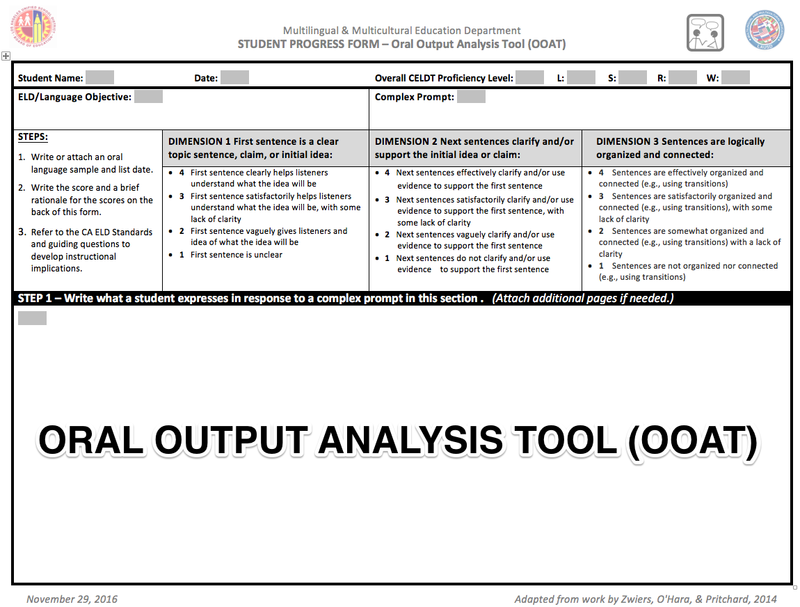 This activity represents an opportunity to collect a Constructive Conversation language sample using the Student Progress Form (SPF). 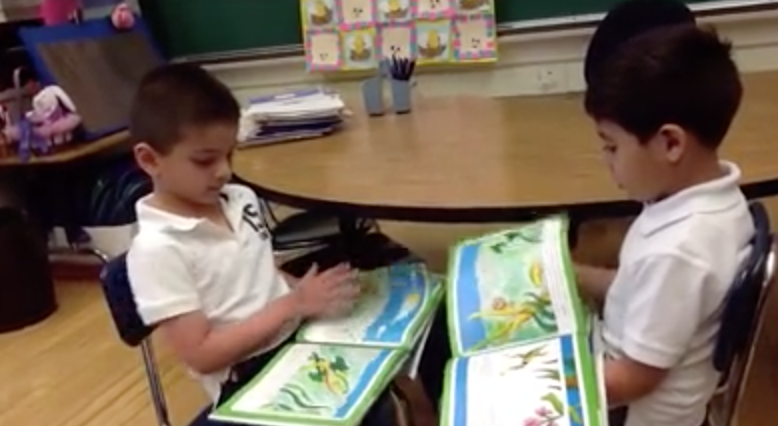 This video shows two students practicing the Constructive Conversation Game using the skill of CREATE. The students are playing as a pair and using all four game cards. 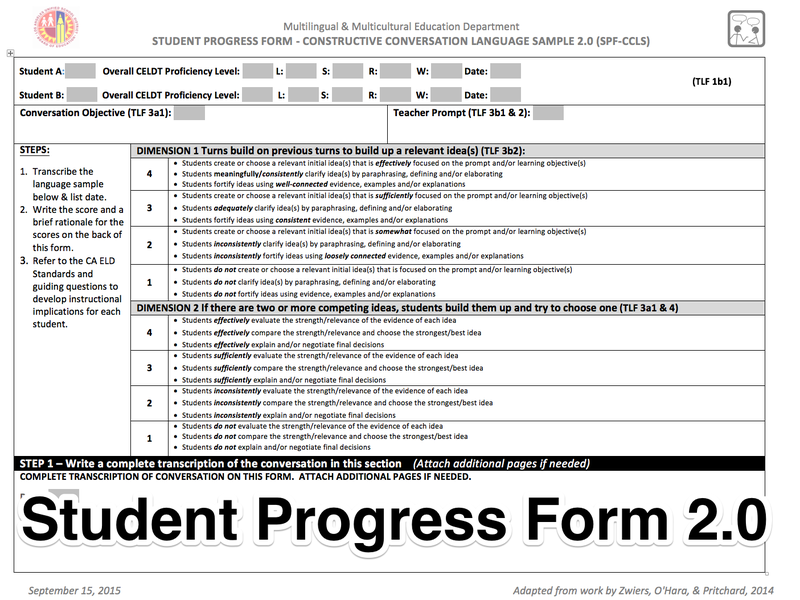 This activity represents an opportunity to collect a Constructive Conversation language sample using the Student Progress Form (SPF). 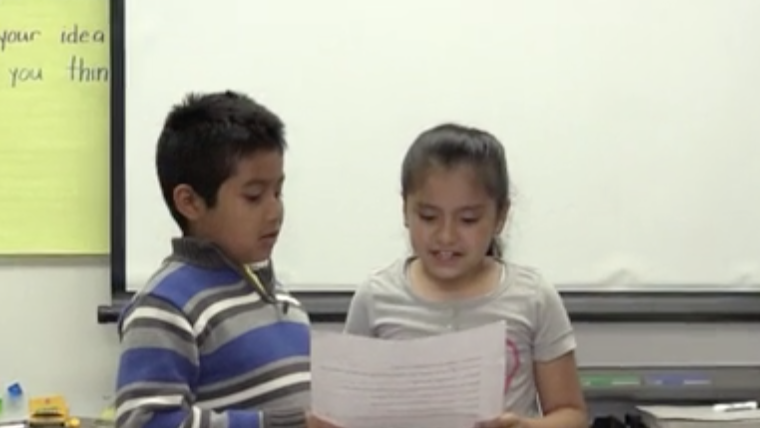 This video documents two SRLDP students as they learn the four Constructive Conversation Skills (CREATE, CLARIFY, FORTIFY & NEGOTIATE) across the school year. Each skill is represented in a short segment. The original videos capture the entire Constructive Conversation between the students and are all over 12 minutes in length.